The Bonderam festival of Goa is celebrated on the Divar Island. 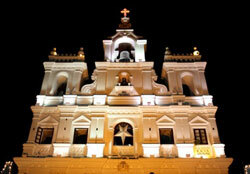 This quiet little island is located at a distance of 12 kilometers from Panaji. The celebration of this festival has a unique history behind it. It is said that many years back, the villagers resented the rules that were adopted for settling disputes regarding the land issues. The Portuguese then set up flags to mark areas where the villagers were unable to take over the lands of the nearby villages. The villagers protested against this system by knocking down all the flags. The Bonderam festival is celebrated in the memory of those protests. Every year in August, this small island becomes alive with bubbling activity of the Bonderam festival. The people residing here come together to celebrate this festival and a carnival like atmosphere is created here. Colorful tableaux are created by the people and a massive parade takes place. Every small community or a group of people come together to celebrate Bonderam festival in Goa. Do not miss to visit this place if you happen to be here during August. There is elaborate feasting during the Bonderam festival and every household is decorated thus presenting a scenic and colorful picture. The villagers engage in a mock fight that represents the knocking down of the flags during the time of the Portuguese. Toy weapons made of bamboo stems are used for fighting and wild berries are used as missiles that are aimed at the rival group. All this is taken in good spirit and all the people come together after the mock fight to eat and drink merrily.